The Betsafe logo is "In it to win it"! If you want to get "in" to the Betsafe Casino, you'll quickly discover that right from the start - beginning with the generous welcome package - boosting your winning chances happens almost immediately. This online casino doesn't fool around when it comes to offering their players the very best in entertainment, rewards or security. A quality iGaming experience is delivered from start to finish. The brand first launched in January 2006 and today has customers in over 100 countries. Betsafe Casino is one part of the gambling brand and is offered in 9 European languages. It is licensed in Malta and the UK and is part of the very reliable Betsson Group. Plus, as you will discover in this Betsafe Casino review, in addition to providing outstanding entertainment, the casino is committed to delivering 24/7 customer support, a variety of trusted banking options and full security. You can also expect Betsafe Casino rtp fairness and a responsible gambling environment. Betsafe games include NetEnt, Betsafe, WMS, Cryptologic, Yggdrasil, and Microgaming, amongst others. This ensures that you will find all your favourite online casino games and slots at Betsafe Casino. All the latest 3D slots and all the table games you can handle can be found at this online gambling playground, including jackpots and a live casino. Some of the most popular slots you'll find include: Rainbow Riches, Immortal Romance, Bonanza, Book of Dead, Raging Rhino, Vikings Go Wild, Wild Toro, Fruit Warp, Gonzo's Quest, Jack and the Beanstalk, etc. In addition to a fabulous range of classic and video slots, you'll also find Betsafe Jackpots. There are over 30 jackpot games from which you can choose to seek out your life-changing fortune. Spin to win on progressive slots like Mega Moolah, Mega Moolah Isis, Joker Millions, Empire Fortune, Major Millions, Apollo, Mega Fortune Dreams, Mega Fortune, and many more. When you're craving something other than slots, Betsafe casino welcomes you to enjoy a number of Video Poker variants (e.g. Jack or Better, Joker Poker, Deuces Wild, etc. ), as well as several variations of both virtual and live casino versions of Blackjack, Roulette and other table games. In fact, if you love live casinos, Betsafe.com has over 80 live casino games! In addition to enjoying the full suite of Betsafe games via instant play, you also can get the Betsafe Casino app for either Android or iOS. The Betsafe mobile version has been tested and functions using top technology, providing easy navigation and seamless gameplay. You can enjoy many of the casino's top games via your Android smartphone or tablet or iPhone or iPad. There was no Betsafe Bonus Code listed when this review was written. Be sure to read all terms and conditions before claiming any offers to make sure you understand how the promotions work. 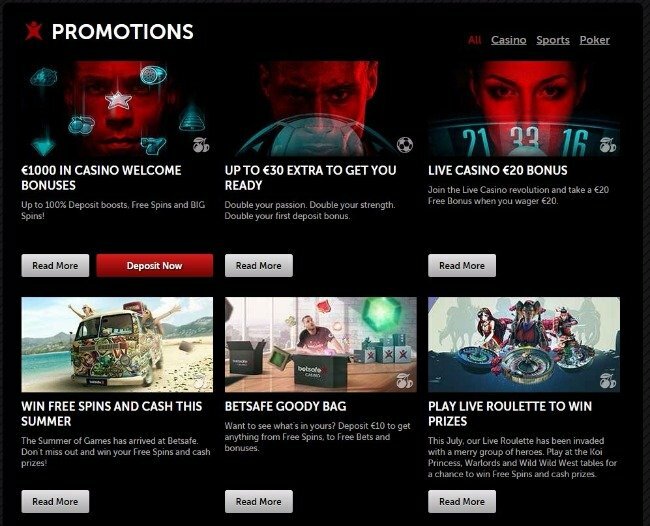 Other Betsafe Casino promotions you can enjoy include a Live Casino €20 Bonus, a Betsafe Goody Bag that awards you with a random prize when you deposit €10, the chance to grab free spins and bonuses by playing the game of the week, a different live casino offer for every day of the week, and so on. Betsafe also offers tournaments, including an exclusive New Player Casino Tournament available to all new players. New players can automatically take part within their first week of joining to compete for a whopping €1,000 prize pool! You can trust that when you make deposits and withdrawals at Betsafe your private and financial information is kept 100% secure and confidential. This is ensured with industry standard security protocols (128-bit SSL encryption data technology). Betsafe banking options include eWallets, creidt and debit cards, prepaid cards and bank transfer. Supported payment methods include: Visa, Maestro, Neteller, Citadel, Visa Electron, PayPal, MasterCard, Entropay, Skrill, Paysafe Card and Bank Transfer. In addition to providing outstanding entertainment, the casino is committed to delivering 24/7 customer support, a variety of trusted banking options and full security. Deposits are instant for virtually all methods but Betsafe withdrawal times do vary depending on the banking option that is selected. On average, processing times are eWallets (24 hours), Credit/Debit Cards (3 - 5 business day) and Bank Transfer (2 - 5 business days). Betsafe Casino supports multiple currencies including: USD, GPB, EUR, SEK, PLN, NOK, BGN. That being said, be advised that not all payment options are available for all currencies. The Help Centre at Betsafe is second to none. It provides three ways for you to get in touch with the knowledgeable and friendly staff. What's more, not only are all these methods available 24/7, but you're actually provided with typical response times. For instance, Live Chat (within 30 seconds), Email (within 30 - 60 minutes), Telephone (within 2 minutes). The Help Centre also provides a phenomenal and highly organized FAQ, so you can always get additional information about Betsafe and see if the answers you need can be found there first. I would seriously love to win the Caribbean Cruise for two that Betsafe is giving away this November! What an outstanding promotion! If you’re a new player, begin by registering an account first and hit the Opt in & Play button. If you’re already a player, hit the Opt In & Play button. Then play any of the games located in the Specials tab on desktop or Video Slots on Mobile. As you play, you will earn points for in-game achievements. Continue to collect your points and climb the Leaderboard. Finish in first place at the end of the week and the cruise is yours!! Seems Betsafe has been the first online casino to release new games on several occasions. They are on top of their game!